What is the Dry Eye or external disease? Cornea Consultants of Arizona in Phoenix describe dry eyes as a condition where there is not sufficient tears to nourish or lubricate the eye. Our doctos explain that tears are very important in maintaining the healthy condition of the surface of the eye because this plays a vital role in providing clear vision. Patients with dry eyes either have tears that have poor quality or they do not produce enough tears. Tears play a very vital role in keeping the eye lubricated and reducing the risk of eye infection. They also wash away any foreign matter that gets into the eye and keeps the eyes smooth and clear so it’s very important to have this addressed if you are suffering from dry eyes. What causes dry eyes and what are the symptoms? Dry eyes are a common condition among older adults. In fact, the majority of people over the age of 60 exhibit symptoms of dry eyes. Some people are naturally predisposed to getting dry eyes like older people and women. The most common cause of dry eyes is when a patient has inadequate amount of the water layer of tears, a condition called Keratoconjuctivitis Sicca (KCS). There are also some usual causes of dry eyes such as medications, existing medical conditions such as rheumatoid arthritis, and diabetes and thyroid problems. Environmental conditions (smoke, wind, and dry climate), long term use of contact lenses, and even laser eye surgery can also contribute to dry eyes. Patients with dry eyes usually experience persistent dryness, eye redness, scratchiness, and often a burning sensation in the eyes. If you do experience any of these, consult an eye doctor to prevent any further damage to your eyes. Your doctor will first try to measure the amount of tears that your eye produces by doing a Schirmer test. At Cornea Consultants of Arizona we use a strip of filter paper and place it under your lower eyelid and this can help in measuring tear production. The most common way of treating and managing mild cases of dry eyes is through using artificial tear solutions that can be bought over the counter in your local drug stores. But if dry eyes have become a chronic condition, your eye doctor might prescribe a treatment to manage the condition and prevent your vision from being affected. Your doctor’s treatment plan will focus on trying to add tears, conserving tears, increasing tear production, and treating any inflammation on the eye that resulted to the condition. PRN provides an assortment of Eye Health products that are generated from a solid body of clinical evidence. Their Eye Health products relieve dry eyes, restore proper tear function, and improve macular health. 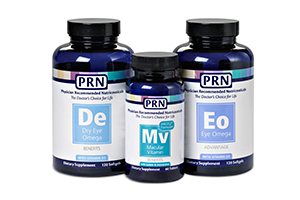 Click here for more information and to order the PRN Eye Health products. Call our offices to learn more about external diseases or click here to schedule a consultation today.